A new study from the Wildlife Conservation Society finds that several iconic Adirondack birds are in trouble, with declines driven by the size of their wetland habitats, how connected these wetlands are to one another, and how near they are to human infrastructure. The Adirondack Park represents the southern range extent for several species of boreal forest birds in eastern North America. Like any species at the edge of its range, they face challenges in this environment. The habitats of these boreal specialists -- cool, wet, sphagnum-draped bogs and swampy woods -- are thought to be vulnerable to climate change, particularly in the Adirondacks where they are more fragmented than in forest to the north. In her paper, "Dynamics of Boreal Birds at the Edge of Their Range in the Adirondack Park, NY," author and WCS Adirondack Program Science Director Michale Glennon explores occupancy patterns over time for eight bird species in lowland boreal forest wetlands in the Adirondacks. The study, which appears in Northeastern Naturalist (2014, Volume 21, Issue 1), presents an evaluation of the potential influence of climate change and habitat alteration on species occurrence patterns over time. A total of 1,105 count surveys conducted between 2007 and 2011 in wetlands ranging in size from 0.04 -- 6.0 square kilometers resulted in 1,305 detections of target species, with yellow-bellied flycatcher (30 percent), Lincoln's sparrow (23 percent), and yellow palm warbler (20 percent) detected most often, and fewer detections of black-backed woodpecker (8 percent), gray jay (8 percent), olive-sided flycatcher (6 percent), boreal chickadee (3 percent), and rusty blackbird (2 percent). Patterns of species occurrence from year to year indicated that these birds function as metapopulations (spatially separated members of the same species that interact with one another through migration in and out of habitat patches). Glennon found that the area and connectedness of their wetland habitats were important, as was nearby human infrastructure, with birds much more likely to disappear from smaller, isolated wetlands that are near development. Occupancy rates for four of the eight study species were in decline; two appeared stable, and only Lincoln's sparrow and palm warbler appeared to be increasing in the Adirondack landscape. However, data collected since the study indicate that the situation may be getting worse. "When I incorporate data collected since 2011, I am seeing declines for all species except palm warbler, some modest but some of them more troubling," said Michale Glennon. "The number of boreal wetlands occupied by five species -- rusty blackbird, gray jay, yellow-bellied flycatcher, olive-sided flycatcher, and black-backed woodpecker -- has decreased by 15 percent or more since 2007." Glennon also looked at whether the birds appear to be shifting to higher latitudes and/or elevations, a pattern documented for many species responding to climate change around the globe. The analysis yielded inconsistent results (some birds moving northward or upward, some not), suggesting that over this small window of time, other factors may be playing a larger role in controlling these species' dynamics. Glennon said, "The species in question are icons of the area and a big reason bird-watchers come to the Adirondacks. It is alarming to think that we can lose them here, of all places. They are very specialized species, however, and have specific habitat needs. In addition to the stresses of a warming climate, they may face competition and displacement from more cosmopolitan birds like blue jays which tend to come along with residential development." WCS Adirondack Program Director Zoe Smith said, "Understanding the processes that drive the dynamics of boreal birds in the Adirondacks can enhance the ability of land managers to influence their long-term conservation. 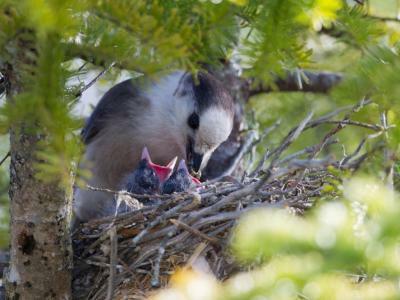 WCS will continue to study these birds and other wildlife of the boreal to help contribute to the long term protection of this vulnerable habitat." In addition to songbirds and woodpeckers, boreal wetlands provide critical habitat for other park icons like moose, loon, and marten.